Rose Gold Claddagh Ring with Celtic Knot design on shoulders. Rose Gold Claddagh Ring, traditional and Contemporary style handcrafted in Ireland and Assay Hallmarked in Dublin. This Claddagh Ring, designed in 9ct Rose Gold and embellished with Celtic Knot design on the Band and designed to make a statement. This beautiful Ring with sleek organic silhouette and Celtic Knot design will sure to take your breath away. Also all our Claddagh Rings, inspired by one of Ireland’s most precious heritage. Buy the highest quality Claddagh Rings at the best prices direct from Ireland. 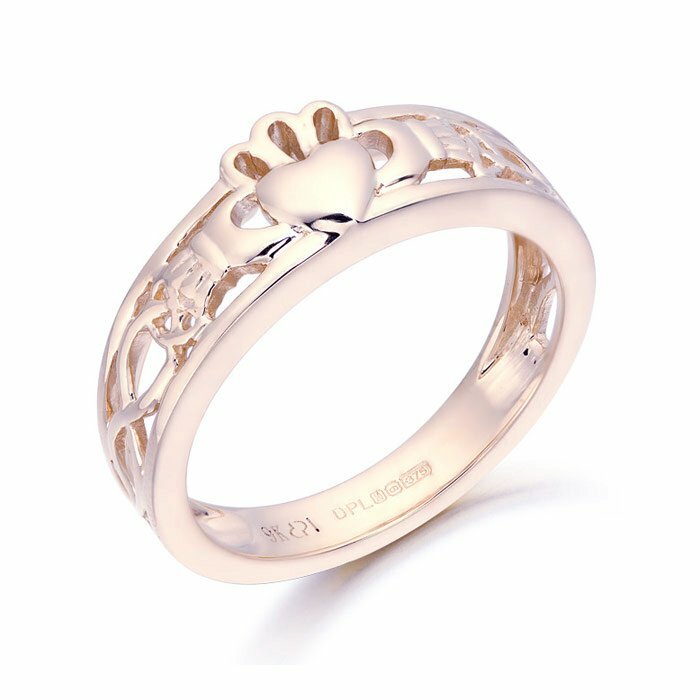 In addition the distinctive design of our Claddagh jewelry designs easily recognised and beloved by many people. Traditional piece of Irish Jewelry which is suitable for any occasion. Finally, take advantage of our Free Worldwide delivery and unbeatable prices.